Lead swiftly. We help you create and execute a business transformation strategy that can drive a rapid turnaround from under-performance to value enhancement. Catalyst for improvement. We help guide you through the intense challenges of a financial restructuring by providing options aligned to your stakeholders and your business. Opportunities found. If your business is experiencing difficulties, we help you manage the complex financial, regulatory and legal obligations. In this rapidly changing environment, every company faces challenges. A step in the wrong direction can sometimes have significant effects on corporate performance and company value. KPMG’s integrated team of specialists guides you through difficult times to deliver real results for your stakeholders. To overcome operational or financial challenges and improve performance, you need to quickly stabilize your cash and liquidity positions and take a realistic view of current options. We provide a seamless approach to stabilizing under-performing companies by identifying opportunities for strategic, operational, organizational and financial change, and executing on them to achieve real results. We help establish solid ground for a turnaround by assessing your liquidity position and creating a stakeholder management plan. Our integrated team of specialists helps you focus on the key questions through the critical stages of change management. Option identification: How can I quickly and effectively assess my options? Stabilization: How can I stabilize the business and assess its financial position? Turnaround strategy: What are the financial paybacks of the various options? Execution: How do I ensure full delivery of the turnaround plan? Value realization: What risks and costs are associated with each path, including contingency plans? Discover the answers and other key considerations by downloading our Turnaround ebook (PDF 2.52MB) or contacting one of our specialists. When a company is experiencing financial difficulties, stakeholders often look for additional information or resources to help rebuild their confidence. We help you understand the complex landscape of borrowers, lenders and shareholders, and manage stakeholder communications, so you stay in front of the issues and make the best decisions. We help you assess short-term liquidity requirements and consider actions to quickly preserve value and address potential risks to stability. Our integrated team of specialists helps you focus on the key questions as you navigate a corporate restructuring to achieve sustainable, operational and financial change. Appraisal and stabilization: Do I have enough liquidity to keep operating? Options assessment: Do I know what has gone wrong and how to fix it? Intra-stakeholder negotiations: How do I keep everyone engaged in negotiations? Development of options: What sustainable capital structure offers the best prospect of success? Implementation: How can I reconcile all stakeholder positions to implement the new capital structure? Ongoing monitoring: How do I ensure that the business is supported through its recovery? Discover the answers and other key considerations by downloading our Financial Restructuring ebook (PDF 2.05MB) or contacting one of our specialists. 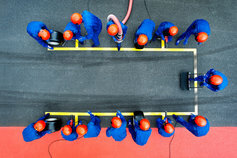 When a company is in distress, the management team faces many competing challenges. We can help you assess the situation and, if necessary, assist you with developing a practical insolvency plan. Working with you and your stakeholders, we help you identify the path that will maximize available value. We help you assess the impact and risks of various options, identify the right filing jurisdiction and prepare a detailed insolvency plan that optimizes the stakeholder positions. We support you as you position your company for a return to health and a solid financial standing. Our integrated team of specialists helps you focus on the key questions through the development, implementation and completion of an insolvency. Distressed corporates: How serious is the problem? Insolvency planning: What are my options? Commencing insolvency: What needs to happen when my company is in a formal protection process? Implementation: How do I maximize value? Exiting a formal process: How does my company get back to normal? Discover the answers and other key considerations by downloading our Solvency Strategies ebook (PDF 2.12MB) or contacting one of our specialists. KPMG specialists combine global insights, sector experience and functional expertise.